Habit: Annual, 3--40 cm, hairy (+- glandular). Stem: ascending to erect. Leaf: on flower stem 5--35 mm, lanceolate or oblanceolate to ovate. Inflorescence: bracts not scarious; pedicels generally 0.5--0.9 × sepals (except lowest). Flower: flower parts 5; calyx 3.5--5 mm, glandular-hairy, with some hairs exceeding tip by 0.2--0.8 mm, scarious margin of most outer sepals < 0.1 mm wide; petals 3--5 mm, 1.5 mm < to 1 mm > sepals, often 0 on lateral branches. Fruit: 3.5--8 mm. Seed: 0.4--0.6 mm. Chromosomes: 2n=72. 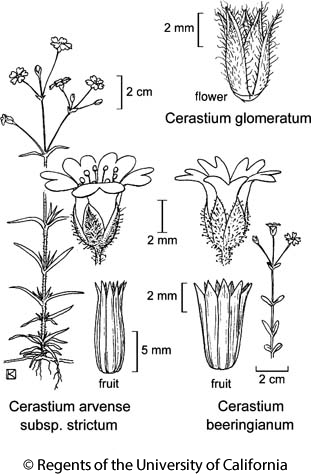 Citation for this treatment: Ronald L. Hartman & Richard K. Rabeler 2012, Cerastium glomeratum, in Jepson Flora Project (eds.) Jepson eFlora, http://ucjeps.berkeley.edu/eflora/eflora_display.php?tid=18675, accessed on April 20, 2019. CA-FP (exc s SNH), MP, DSon; Markers link to CCH specimen records. Yellow markers indicate records that may provide evidence for eFlora range revision or may have georeferencing or identification issues. Purple markers indicate specimens collected from a garden, greenhouse, or other non-wild location.